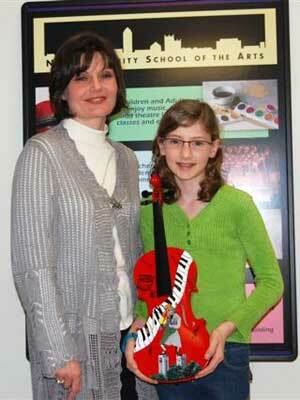 Somonauk artist Anna Kennedy and her daughter, Sophie, show the painted violin created for Performathon. The NIU Music Building will resound with music and excitement Saturday, March 10, as the NIU Community School of the Arts presents its 10th Performathon. All funds raised are used for arts scholarships for young people in the community. Featuring around 75 musicians of all ages, the Performathon is the community school’s major fundraising event. Students collect pledges from family and friends who support their playing, singing or artwork. Local businesses also support the Performathon through advertising in the event’s program booklet and by donating prizes for the raffle. Since 1993, nearly $85,000 has been raised and more than 700 scholarships awarded to deserving local students. The NIU Community School of the Arts offers year-round private lessons, music ensembles, and group classes in music, art and theater for children and adults. New in 2012 is a chance to win a stunning painted violin, created by Somonauk artist Anna Kennedy. 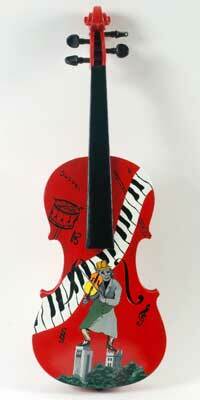 Kennedy’s “Jest Fiddlin’ ” is in the style of Chagall and is a tribute to the community school and NIU. “I wanted the violin to be a representation of the NIU Community School of the Arts,” Kennedy writes in her artist’s statement. Tickets cost $5 apiece (or six for $25) and are available online or by calling (815) 753-1450. The winning ticket will be drawn after the final performance March 10; the holder of the winning ticket does not need to be present to win. T-shirts featuring the violin also are for sale. The deadline for ordering T-shirts is March 1. Other events at the Performathon include a music sale of donated sheet music and music-related items marked for resale at very low prices and a bake sale with goodies prepared by expert bakers. Donations will be taken at the door or can be mailed to: NIU Community School of the Arts, College of Visual and Performing Arts, Northern Illinois University, DeKalb, IL 60115; make checks payable to the NIU Foundation.